As luxury shoppers, we grapple regularly with decisions of how much we’re willing to pay and what we’re willing to pay for. $2000 for a leather bag? Maybe. $2000 for python? Seems more reasonable. $2000 for canvas? Not unless it’s Louis Vuitton and you’re already a huge fan of the brand. But everyone’s shopping agenda is clearly relative to their income and lifestyle, and being comfortable and happy with one’s own purchases should be the chief goal. A “reasonable” price means something different for everyone. 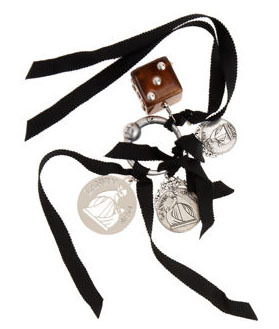 That being said, I’m sure someone out there has purchased the Lanvin Dice Charm Key Ring at some point in the past, but for the $380 asking price, I’m not sure how anyone could be satisfied with what they’re getting for their money. I’m not sure what a key chain that’s “worth” $380 would look like, but I’m pretty sure it’s not this. At the very least I’d expect some precious metal and maybe some pavÃ© Swarovski crystals – something super glam. As far as a key chain has the capacity to be glam, at least. But what we have here is a Lucite die, some signature Lanvin metal coins, and tassels made out of what appears to be no more special than regular grosgrain ribbon. The look is classic Lanvin, but there’s nothing particularly luxe or special about it – the profit margin on one of these things has to be at least 90%. If there’s someone out there that thinks this item is worth $380, I have no idea how he or she came to that conclusion. Buy through Barneys for $380.